Soon Kueh is a traditional Teochew snack and being a 100% "pure-bred" Teochew, I decided to give it a go. The recipe seems relatively easy but requires the cook to have both the frying and pastry making skills. While I am better at kneading doughs, I can't say the same with my wok frying skills. Hence, the Mother was recruited in this Project Soon Kueh. (4) Add the black soy sauce, oyster sauce, chicken cube, pepper amd water. Stir well and leave to simmer over low fire till water is fully absorbed and yambeans are tender. (3) Pour the boiling liquid into the mixing bowl and mix well with the flour. Do not pour the liquid all at once but knead and pour the liquid portion-by-portion till a smooth dough is achieved. Let the dough stand for 10 minutes. (+) The quantities for the filling ingredients are purposely left out as there's alot of room for flexibilities! 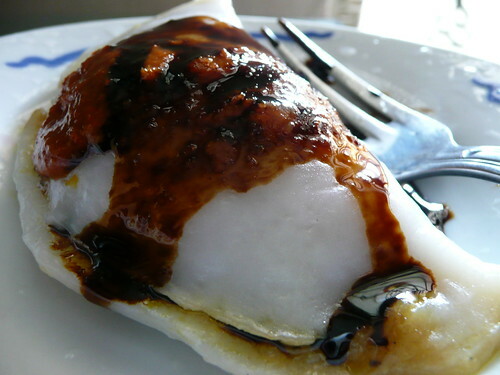 For a lighter coloured filling, less black soy sauce should be added. If you relish a more salty filling, more chicken cubes could be added or alternatively, more oyster sauce. (-) While rolling the skin, it should not be too thin as it tears easily during assembling. (=) With help from the Mother, the project became an obvious success! Received the thumbs-up from the Father!